The semi arid grasslands of Kutch in Gujarat are one of the few abodes of the critically endangered Indian Bustard (Ardeotis nigriceps), also known as the Great Indian Bustard. Though Kutch has been known for its second highest breeding population for this species, severe pressures of habitat loss due to unplanned industrialisation and agricultural encroachment over the past few years has resulted with a drastic decline in the population of this majestic bird. The population estimates reveal an estimated population of less than 30 birds in Kutch out of the total 300 birds surviving in the wild today. The Indian Bustard shares its habitat with other species of the bustard family – MacQueen’s Bustard (Chlamydotis macqueeni) and Lesser Florican (Spheotides indica), both vulnerable and endangered respectively as per the IUCN Red List. All these 30-odd Indian Bustards survive in the Abdasa taluka of Kutch district. India has declared 13 sanctuaries for the protection of this bird. One of these, the Kutch Bustard Sanctuary spread over a mere 2 sq km, is located near Lala village near Naliya in Abdasa taluka. However, a major breeding population of Indian Bustards thrives outside the protected area, in Abdasa taluka. The areas outside this notified Protected Area serve as the breeding, display and wintering areas of these birds. Apart from the reasons of habitat loss as mentioned above, constant threat from uncontrolled cattle grazing over its potential habitat and occasional hunting by trigger-happy people is taking these birds closer to extinction. The Indian Bustard is included in Schedule I of the Wildlife (Protection) Act of India. It is extremely essential to stop and remove the encroachment from the important areas for GIB. Industrial projects cannot be sanctioned on the land used by Indian Bustards. The Corbett Foundation appeals to the State Government of Gujarat and the Ministry of Environment of Forests, Government of India to take immediate action to protect the Indian Bustard habitat and save this species from extinction in Gujarat. 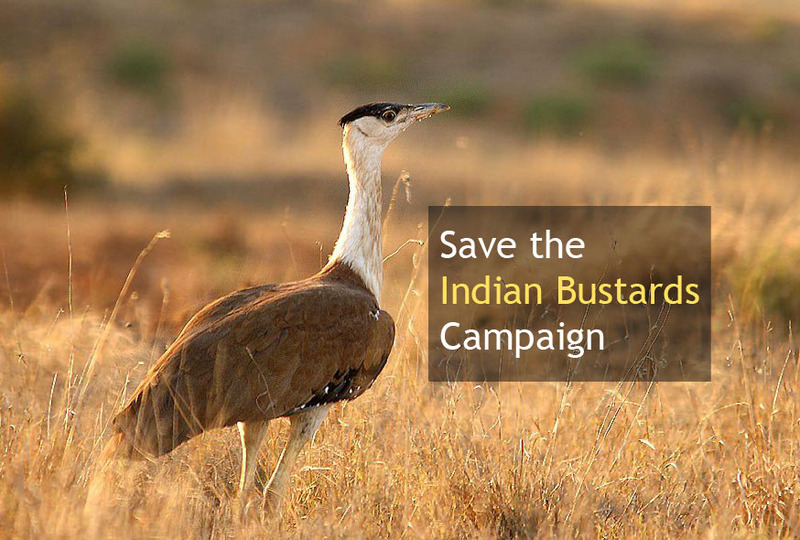 All local and national NGOs, bird-watchers, naturalists, conservationists, scientists and the people of India and the world must come together and in unison make the plea to save Indian Bustards. This might be LAST call to save this magnificent species from Gujarat.